I just finished reading a new book that may bring comfort to anyone who has lost a loved one. 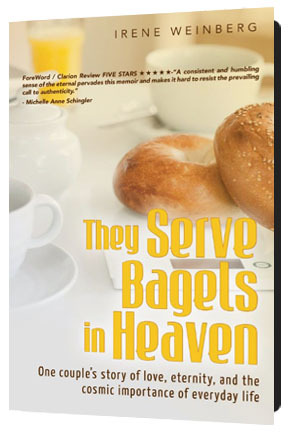 If nothing else, “They Serve Bagels in Heaven” is a thought-provoking and interesting read. It’s a touching love story and memoir that provides one woman’s uplifting spiritual insights into will we see our loved ones again, what is it like in heaven, and what is our purpose on earth. Regardless of whether you believe in angels and heaven, life after death, or reincarnation, the concepts of love and being kind to yourself and others will resonate. It’s the story of a woman I recently met, Irene Weinberg. She was once just an ordinary NJ businesswoman, housewife and mother, and not a believer in anything particularly religious or spiritual. But her world view unexpectedly changed after her husband died in a horrific auto accident. Weinberg’s spiritual awakening begins after receiving messages from her husband Saul, channeled to her from “the other side.” Her fascinating story is told in her own words, as well as those of her husband. Their accounts of past lives as soul mates through the ages are eye opening as well as entertaining, and a lesson that love transcends your physical life on earth. 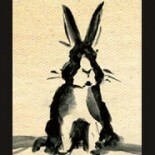 You may have to suspend logic and reason, and just go with the flow. But, I found Weinberg’s spiritual insights comforting, and perhaps you will, too. Around the holidays, when the sense of loss of a loved one can be at its deepest, this book may be the most thoughtful gift you can give to yourself or a friend. “They Serve Bagels in Heaven: One Couple’s Story of Love, Eternity, and the Cosmic Importance of Everyday Life” is available in paperback or eBook at Amazon or paperback at Barnes and Noble. By the way, in addition to being a writer, mother, stepmother and grandmother, Weinberg is a founding member of the nonprofit New Jersey Coalition for Kids in Grief (Good Grief), a group that educates adults on helping children to cope with grief and loss. She has become a noted speaker who travels the country presenting workshops on the afterlife, the importance of healing, and our purpose on earth. For more about Weinberg’s story, visit www.TheyServeBagelsinHeaven.com. In the interest of total transparency, I’ll mention that I am giving Weinberg ideas on how to promote her book. Having said that, I found it very comforting, and thought it may be a helpful resource for someone you know who has lost a a family member or friend. If you read it, do let me know what you think by dropping me a comment, below. Better yet, post a review on Amazon! This entry was posted on December 18, 2014 by Suzy Kedzierski in Helpful Resources for... and tagged angels, heaven, is there life after death, loss of a loved one, love, religion, spiritual, women's interests.